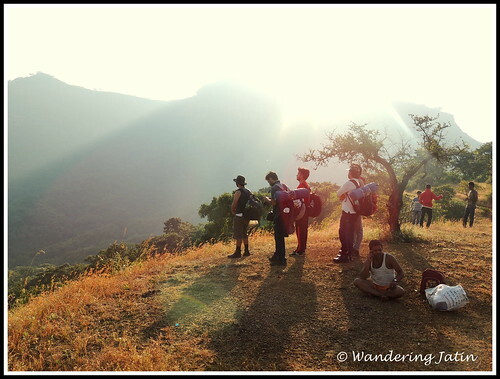 This story is from one of the most favourite trips of mine – the trek to Rajgad and Torna Fort in Sahyadris, Maharashtra. 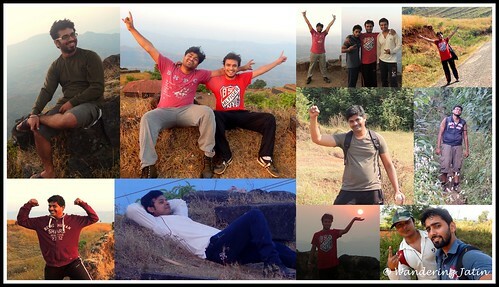 I was leading this trek for 6 friends of mine who joined me even after knowing it was my first time there. Paying extra bucks to the cab driver to zzoopp through the traffic, we reached Hyderabad rail station to reach Pune to reach Gunjavane hopping 2 buses to the start point of the trek around mid noon! The first 2 kms of walk in the Sun on the paved concrete exposed tonnes of goof ups at our end. For starters, some of the backpacks were heavy. We had only 2 bottles of drinking water left. The Sun was performing its duty too well, and most of us lacked hats. The chemistry of socks and shoes was not friendly for some. Despite announcing the essentials beforehand, we can never pack just right, can we? Nevertheless, be rest assured that just when a camera pointed at us, we were all smiles! Half an hour into the trek, we encountered the first rough steep patch, post which it kept going tougher and steeper. Having done some treks earlier, I would call it easy to moderate but a few seemed to have trouble getting through. 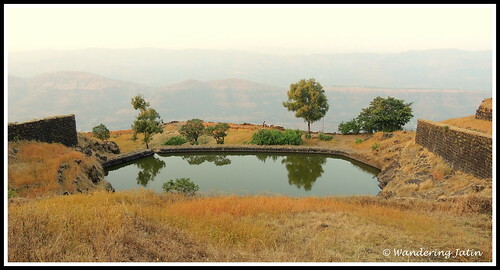 The rising elevation brought the chilling winds, which greeted our bodies, hot from the trek, in a sour manner. 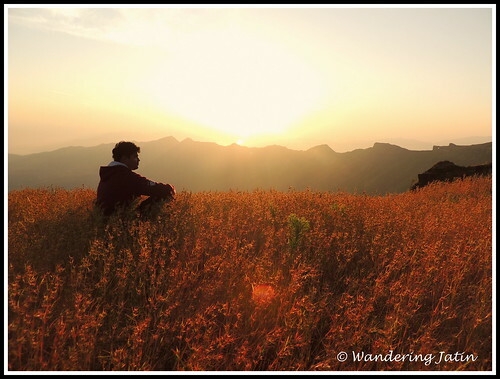 But the deep valleys before us, the best of Sahyadris’ panoramic views – which stretched beyond the point eye could see and the engaging trek itself provided the much needed distraction. 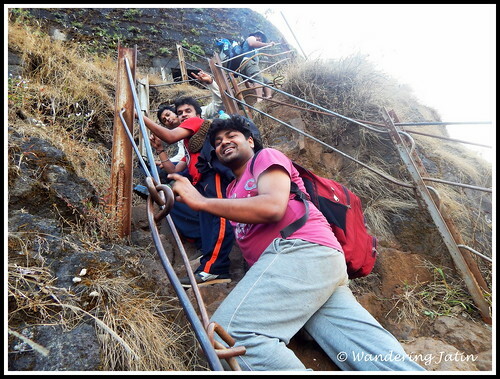 Towards the end, a very steep, narrow, curved, and dangerous stair case (no wonder it was called Chor Darwaza – secret backdoor!) 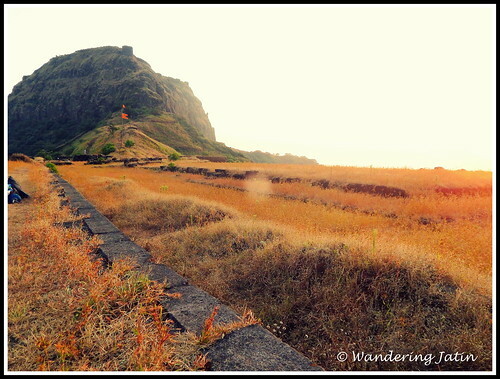 led us into the Rajgad Fort, which once had been the capital of Shivaji Maharaj himself. From Narsapur, near Pune, there are multiple starting points – we started from Gunjavane which is a rather difficult one than the rest. Carry your own supplies, including tents. 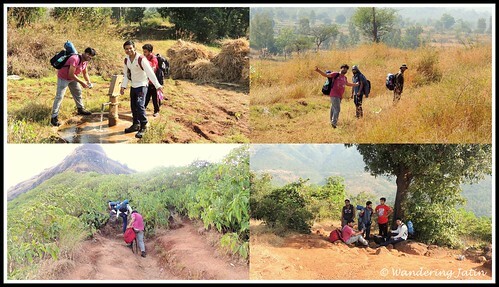 For experienced trekkers, the trek is easy to moderate and takes around 4 to 5 hours. 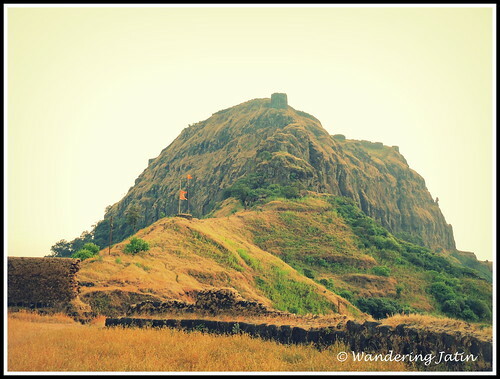 You don’t find/need a guide around here (carry a map) – just start exploring the Fort, the points are marked, and the locals can help. You can gather wood by little exploration and have a camp fire. You can camp in vast open spaces or spend the night in the temple, as most trekkers do. 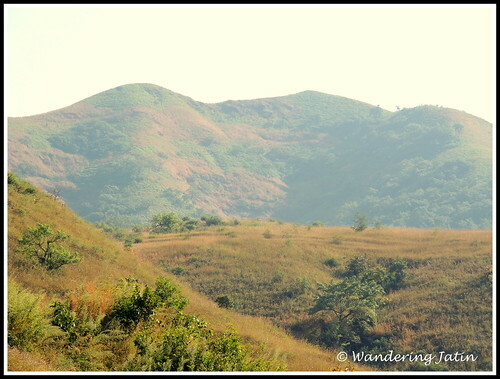 While most rested upon reaching, I scouted the area to look for camping ground – a flat area at an elevation to the nearby grounds giving the on-top feeling! Dipanshu and Ayush, like good boys had brought 2 bedsheets each as advised, and the three of us shared the tent making the most comfortable bed I have even been in! Malto and Gopal settled in the other one while Arun and Srikanth found shelter in the temple nearby. 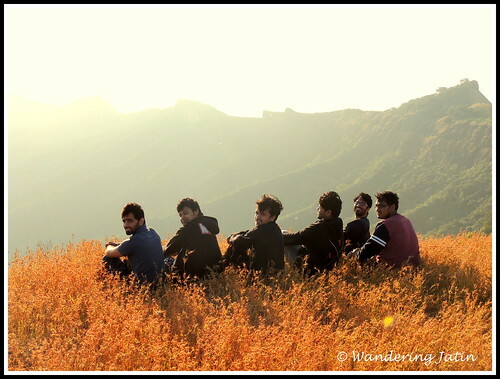 With the Sun settling down in the valley leaving behind the luminescent clouds, we were posing all kinds of pictures while one of the caretakers around there served us poha and tea! Our hoodies, jackets and ear flaps were out in response to the dropping temperature, and we had camp fire arranged from the same caretaker. Again, the good boys, Deepanshu and Ayush, had brought enough food supplies to last for days. 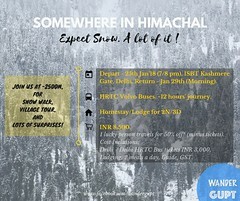 We savoured the instant maggi and poha and biscuits and snacks and aloo bhujia (not a good idea for your camping mates!) to our full, and that was after we had mistakenly left a bag of food back home! We had made enough noise I suppose or was it the fire, that drew a few other trekkers to our group and we made instant friends! With the prelim interactions, we sat there around the fire talking when someone mouthed the word – dance! 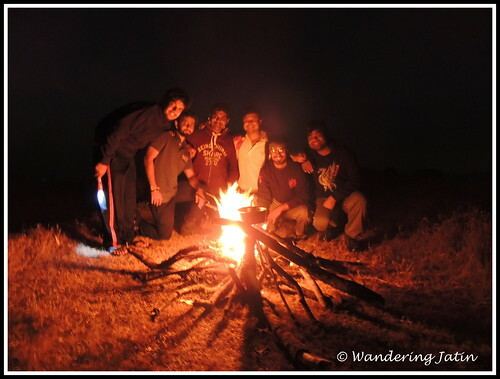 Away from homes, in the lap of the mountains, we then celebrated life, dancing around the fire woohoo-ing all the time. It felt awesome! Our new friends took us to some fort explorations later and the craziness continued as we trekked the fort up in the moon light deliberately keeping our torches turned off. We explored some underground chambers and made all kinds of stories around them! We also went to meet a lot of other trekkers that night, some busy making their beds and others, the dinner. 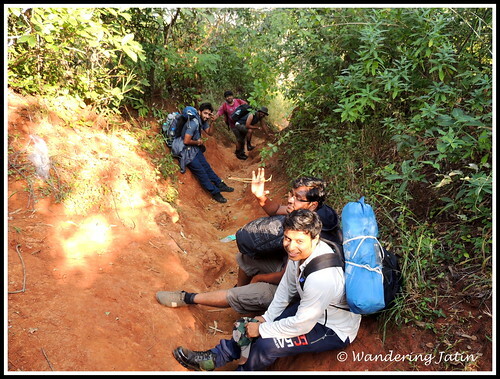 Out there trekking, we had our own share of ‘fun’ instances in the group. 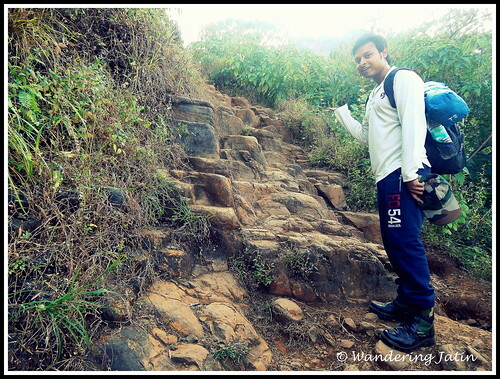 Hardly into the hike, Deepanshu expressed his extreme craving for pizza and his inability to trek further by remembering his mum! I had made the text book mistake of trekking with my new boots, and blisters made my life miserable. Malto, the fit guy had to carry one of the tents all the time. Ayush and Deepanshu didn’t have confirm tickets in the train back home. Also, someone ‘almost‘ walked in on Ayush performing his morning duties the next day. And nothing much, sitting around the fire, somebody passed Kerosene when Gopal asked for water, and he had a sip of it (and gargled, brushed and coughed it later)! Teasing each other, talking and laughing we slept that night to wake up next day to a beautiful sunrise when a surprising turn of events unfolded before us, check that out in the next post! 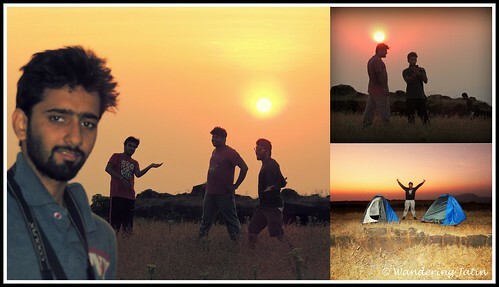 Camping in Kerala – the uncommon way! The night I camped solo on a beach. Fun and memorable experience indeed. Thank you so much Balaka!